Enjoy the peace and quiet of the French countryside at Les Mimosas, a cozy cottage set amongst the pine trees in Prades sur Vernazobre. Two bedrooms, sleeps up to 4. 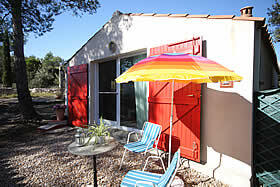 Les Mimosas is located on the edge of the village of Prades sur Vernazobre, a small village 27km northwest of Beziers. The cottage is situated in peaceful surroundings among the pine trees, about 25 metres from the owners' property, and accessed by a shared drive. Outside the cottage is a carport, where you can leave your car in the shade. Open the sliding door and step into the bright living room. At one end is the fitted kitchen, which is equipped with a gas cooker, extract hood, microwave oven, electric kettle, toaster and coffee maker. The dining table folds out to seat four persons, and there is a sofa and two comfortable chairs. The sliding door is also equipped with a fly screen. On the desk in the living room you'll find a mini HiFi, with CD, radio and cassette player. A TV and DVD player are also available. The air-conditioning unit in this room keeps the cottage comfortably cool in the summer and warm in the winter. The spot at the front of the cottage is ideal for breakfast, and there is a larger terrace on the side of the house, which is shaded by a wisteria climbing on a pergola and perfect for eating your meals outside, or sitting listening to the birds or the cicadas. An electric BBQ allows you to make the most of outdoor living (because of the fire hazard charcoal BBQs are now allowed). The swimming pool (8 x 4mt) is located between Les Mimosas and the owners' house and is yours to use whenever you wish. The views from the terrace around the pool are over the hills and valleys surrounding Prades, which are perfect for walks or strolls. The two bedrooms are equipped with a double bed each, and there is space for your clothes. The windows are fitted with fly-screens for comfort. The shower room has a walk-in shower and a wash-hand basin. The separate WC is off the living room, where you will also find a washing machine, as well as an iron and ironing board. Prades is a small but lively village, with numerous fetes throughout the year. The village grocery store is open six mornings a week and stocks fresh bread daily. There is also a village post office, and the wineries in the village will welcome you for a tasting. Further shops, restaurants and services can be found in St Chinian or in Cessenon, both less than 10 minutes by car. Please note that because of the terrain the house is not suitable for small children or persons with impaired mobility.